Lasers were first used for cutting in the 1970s. In modern industrial production, laser cutting is more widely used in sheet metal, plastics, glass, ceramics, semiconductors and materials such as textiles, wood and paper. In the next few years, the application of laser cutting in precision machining and micro-machining will also gain substantial growth. First, let’s see how laser cutting works. When the focused laser beam hits the workpiece, the irradiation area heats up rapidly to melt or vaporize the material. the laser beam moves along the contour and melts the material. Usually, a jet stream is used to blow the melt away from the incision, leaving a narrow gap between the cutting part and the frame. Narrow seams are almost as wide as a focused laser beam. Flame cutting is a standard technique used in cutting low carbon steel. Oxygen is used as cutting gas. The oxygen pressurized is increased up to 6 bar before blowing in the incision. There, the heated metal reacts with oxygen: it starts to burn and oxidize. The chemical reaction releases a large amount of energy (five times the amount of laser energy) to assist the laser beam in cutting. 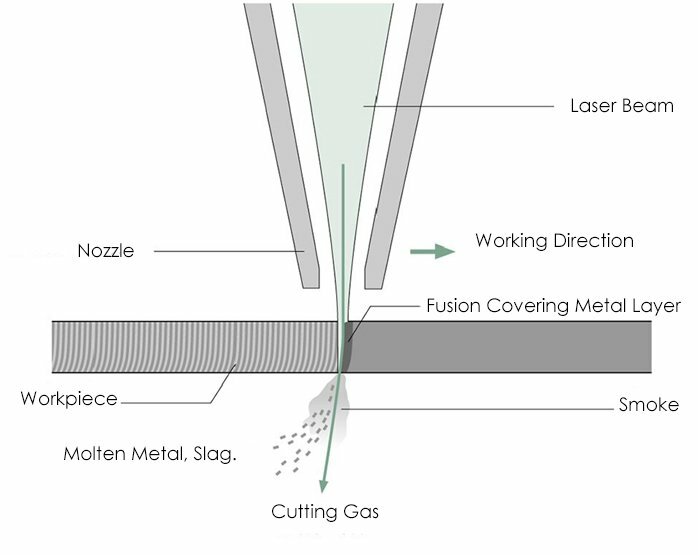 Fusion cutting is another standard process used in metal cutting, and it can also be used to cut other fusible materials, such as ceramics. Using nitrogen or argon gas as cutting gas and the air with 2-20 bar pressure blown through the incision. Argon and nitrogen are inert gases, which means they don’t react with the molten metal in the incision, just blowing them down to the bottom. Meanwhile, the inert gas can protect the cutting edge from air oxidation. Compressed air can also be used to cut thin plates. Air pressure increased to the 5-6 bar is enough to blow away molten metal in the incision. Since nearly 80% of the air is nitrogen, compressed air cutting is essentially a melting cut. 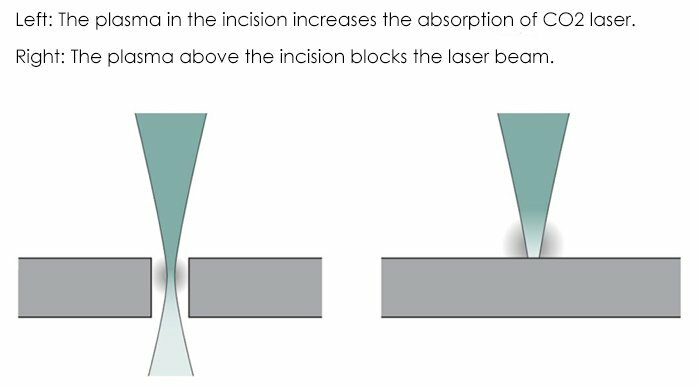 If the parameters are selected properly, plasma clouds will appear in the plasma-assisted fusion cutting incision. The plasma cloud consists of ionized metal vapor and ionized cutting gas. The plasma cloud absorbs the energy of the CO2 laser and converts it into the workpiece, allowing more energy to be coupled to the workpiece, which melts the metal faster and making the cutting faster. Therefore, the cutting process is also called high-speed plasma cutting. The plasma cloud is actually transparent to the solid laser, so the plasma-assisted fusion cutting can only be used on CO2 laser cutting. The gasify cutting vaporizes the material and minimizes the thermal effect on the surrounding material. Using continuous CO2 laser processing to evaporate materials with low heat and high absorption can achieve the above effects, such as thin plastic film and non-melting materials such as wood, paper and foam. Ultrashort pulse laser allows this technique to be applied to other materials. The free electrons in the metal absorb the laser and heat up dramatically. The laser pulse does not react with molten particles and plasma, and the material sublimates directly, without the time to transfer energy to the surrounding material in the form of heat. 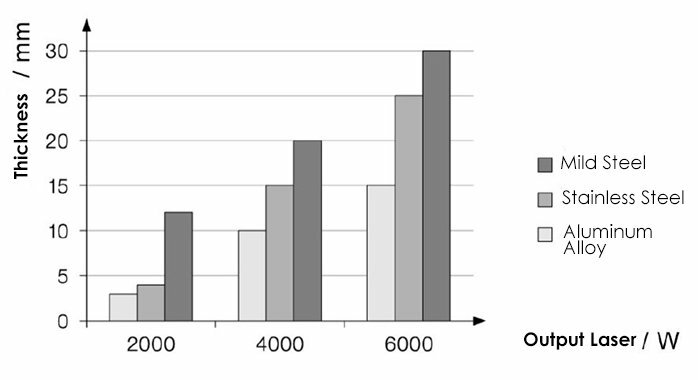 There is no obvious thermal effect in picosecond pulse ablation material, no fusion and burr formation. 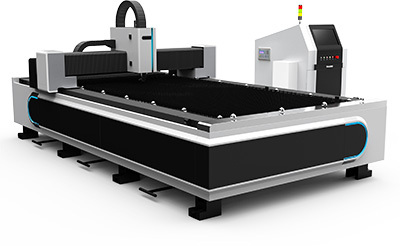 Many parameters affect the laser cutting process, some of which depend on the technical performance of the laser generator and the laser cutting machine, while others are varied. The degree of polarization indicates what percentage of the laser is converted. The typical degree of polarization is about 90%. This is sufficient for high-quality cutting. The focus diameter affects the width of the incision and can change the focus diameter by changing the focal length of the focus lens. Smaller focus diameter means narrower incisions. 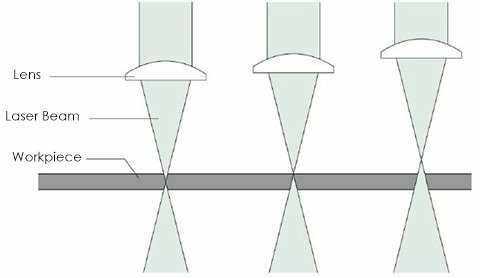 The focal position determines the beam diameter, power density and the shape of the incision on the surface of the workpiece. Fi.4 Focus position: inside, surface and the upward side of the workpiece. Laser power should be matched with machining type, material type and thickness. The power must be high enough that the power density on the workpiece exceeds the processing threshold. The continuous mode is mainly used to cut the standard contour of metal and plastic with the thickness from millimeter to the centimeter. In order to melt holes or produce precise contours, low-frequency pulsed lasers are used. Laser power and cutting speed must match each other. 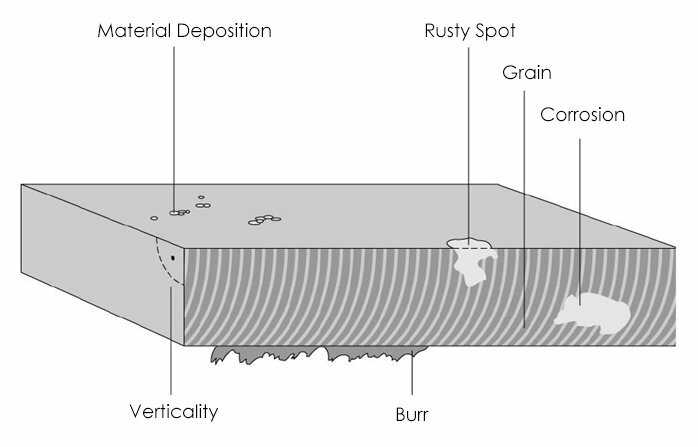 Too fast or too slow cutting speed can lead to increased roughness and burr formation. The diameter of the nozzle determines the flow of gas and air flow shape from the nozzle. The thicker the material, the larger the diameter of the gas jet, and accordingly the larger diameter of the nozzle opening. Oxygen and nitrogen are often used as cutting gases. The purity and pressure of the gas affect the cutting effect. When cutting with oxygen flame, the purity of gas is 99.95 %. The thicker the steel plate, the lower the gas pressure. 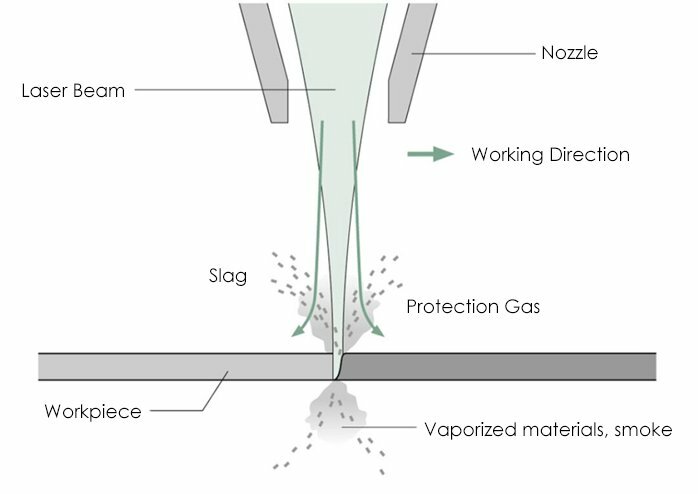 When cutting with the nitrogen, the purity of the gas should reach 99.995% (ideal 99.999%), which requires a higher pressure when melting and cutting thick steel plates. In the early stage of laser cutting, the user must determine the setting of the machining parameters by the test operation. Now, the mature processing parameters are stored in the control device of the cutting system. 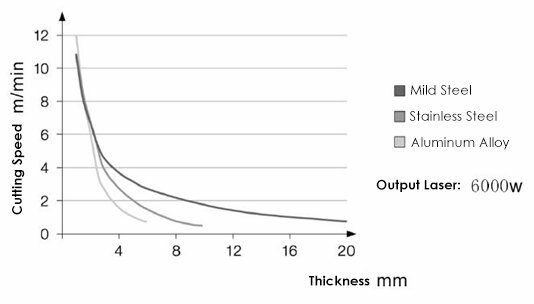 For each material type and thickness, there are corresponding data. Technical parameters make it possible for people who are not familiar with the technology to operate laser cutting equipment smoothly. There are many criteria to determine the quality of laser cutting edges. For example, the standard of burr form, sag and grain can be judged by the naked eye. The straightness, roughness and width of the incision need to be measured by special instruments. Material deposition, corrosion, thermal influence region and deformation are also important factors to measure the quality of laser cutting. 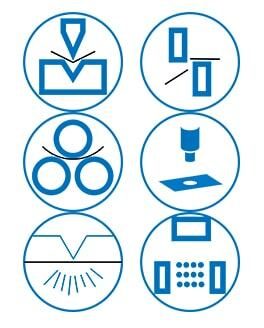 You can also check out the 9 standards to check laser cutting quality. The continuous success of laser cutting is beyond the reach of most other techniques. That trend continues today. In the future, the application of laser cutting will be more and more promising. Interesting info for the beginner to set up good cut conditions for metals. Many of these principles do apply to fiber laser too.